This discography documents the releases of albums and singles by Aretha Franklin, who is ranked first among female vocalists with the most Billboard chart hits during the rock era (1955–2012) with a total of 88 according to Joel Whitburn's Record Research. A "Never Grow Old" was reissued by Checker Records in 1957, 1968 and 1973. B "Precious Lord (Part 1)" was reissued by Checker Records in 1960 and 1969. 1960 "Today I Sing the Blues"
c/w "Love Is the Only Thing"
b/w "Maybe I'm a Fool"
c/w "Without the One You Love"
c/w "It's Just a Matter of Time"
c/w "The Christmas Song (Chestnuts Roasting on an Open Fire)"
The following singles were released or re-released after Franklin left Columbia. b/w "Prove It" (from Aretha Arives"
1968 "(I Can't Get No) Satisfaction"
1985 "Freeway of Love" 3 3 1 11 1 6 5 68 Who's Zoomin' Who? ^ a b "Aretha Franklin Chart History: Billboard 200". Billboard. Retrieved 2018-08-28. ^ a b c d e f "US Albums Charts > Aretha Franklin". AllMusic. Retrieved 2010-06-18. ^ a b c d e f g h i j k l m n o p q r s "US Charts > Aretha Franklin". Billboard. Archived from the original on 18 June 2010. Retrieved 2010-06-18. ^ a b c d David Kent (1993). Australian Charts Book 1970–1992. Australian Chart Book Pty. Ltd., Turramurra, N.S.W. ISBN 0-646-11917-6. ^ a b c d e f g h "Canadian Charts > Aretha Franklin". RPM. Retrieved 2012-01-13. ^ a b c d "Aretha Franklin | full Official Chart history". Official Charts Company. Retrieved 2018-08-25. ^ a b c d e f g h i j k l m n o p q r s t u v w x y z aa ab ac "US Certifications > Aretha Franklin". Recording Industry Association of America. Retrieved 2012-01-14. ^ a b "CAN Certifications > Aretha Franklin". Music Canada. Retrieved 2012-01-14. ^ a b c d e f g "UK Certified Awards Search > Aretha Franklin". British Phonographic Industry. Retrieved 2012-01-14. ^ a b Bell, Carrie (28 February 1998). 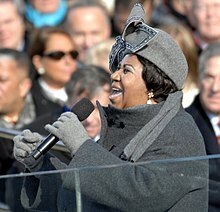 "Aretha Franklin Blossoms Anew". Billboard. p. 91. Retrieved 15 April 2019. ^ "Ask Billboard: She Loves Me! She Really Loves Me!". Billboard. 2007-05-18. Retrieved 15 April 2019. ^ "Aretha Franklin Chart History: R&B/Hip-Hop Albums". Billboard. Retrieved October 9, 2018. ^ "AUS Charts > Aretha Franklin". ARIA Charts. Retrieved 2012-01-14. ^ "ARIA Australian Top 50 Albums". Australian Recording Industry Association. August 27, 2018. Retrieved August 25, 2018. ^ Caulfield, Keith (August 26, 2018). "Ariana Grande Earns Third No. 1 Album on Billboard 200 Chart With 'Sweetener'". Billboard. Retrieved August 27, 2018. ^ "Ariana Grande's 'Sweetener' Sours Travis Scott's Success". FYIMusicNews. Retrieved August 28, 2018. ^ a b c d Rosen, Craig (4 October 2003). "Atlantic/Rhino Deal Lets 'Crown Jewel' Shine". p. 28. Retrieved 15 April 2019. ^ a b c d e f g h i j k l m n "US Singles Charts > Aretha Franklin". Allmusic. Retrieved 2010-06-18. ^ "Aretha Franklin - Chain Of Fools". ultratop.be. Retrieved 2018-08-19. ^ "Suche - Offizielle Deutsche Charts". offiziellecharts.de (in German). Retrieved 2018-08-19. ^ "Dutch Charts - dutchcharts.nl". dutchcharts.nl. Retrieved 2018-08-19. ^ "Grammy's Greatest Moments Vol. 2: Various Artists". Amazon.com. Retrieved 2011-11-25. ^ "Grammy's Greatest Moments, Volume III: Various Artists". Amazon.com. Retrieved 2011-11-23. This page was last edited on 15 April 2019, at 14:21 (UTC).